AcmeBarGig offers us no less than eleven free amp simulators. To be completed with a speaker cabinet simulator in order to get sounds that go from Vintage to Metal and good old Rock. The included audio samples are only a mere example of what these amps can do. Twist the buttons to make them shriek and yell! Note that Acme Bar Gig offers other products, some free, some commercial. Visit their website to check them out. Also note that their website has been down for a few months, but the company's founders are working on new ways to communicate about their products. These simulations are provided under the form of "DLL" files. They must be used within a hosting software, such as a Digital Audio Workstation (D.A.W. ), and thus cannot be used alone. Click here to know ho to use them. - Les Paul-shaped guitar, the brand is SR Guitars, equipped with 3 pickups: a modern Humbucker neck pickup, a vintage P90-like middle pickup, a vintage Humbucker bridge pickup. - Fender Stratocaster American Deluxe with stock pickups. - Fender Telecaster American Deluxe with 2 Humbucker custom pickups : The neck pickup is a Lollar Regal, the bridge pickup is a Fender Wide Range. Simon used the Lollar for demos with distorsion, and the Fender for clear demos. - Each demo includes two guitar tracks, recorded separately (no copy and paste), and panned right and left in the stereo field. - With each demo, two different impulse responses (different microphones) were used with each guitar. - No distorsion pedal was used, in order to show whether or not the simulations can produce the distorsion needed in some musical genres. 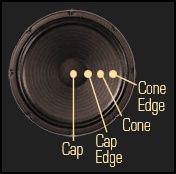 1 impulse of baffle Marshall 1960A (loudspeaker: G12M) through a microphone Neumann U67 in Cap Edge position, at a distance of 2 inches (5 cm). Stereo panning: 100% left. 1 impulse of baffle Marshall 1960A (loudspeaker: G12M) through a microphone Neumann U87 in Cap Edge position, at a distance of 4 inches (10 cm). Stereo panning: 100% left. 1 impulse of baffle Marshall 1960B (loudspeaker: V30) through a microphone Shure SM57 in Cap Edge position, at a distance of 1 inch (2.5 cm). Stereo panning: 100% right. 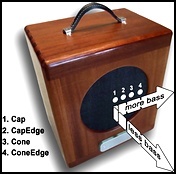 1 impulse of baffle Marshall 1960B (loudspeaker: V30) through a microphone Royer R-121 in Cap position, at a distance of 3 inches (7.6 cm). Stereo panning: 100% right.